I have a one year old. It goes without saying that I need a good stain remover. But, nope. It’s just laundry. And I’m over it. The internet and even popular women’s magazines are littered with creative, homemade, DIY stain solutions, and they all have their merits and their downfalls. For me, it want quick, easy, effective and cheap, and if I have to use original blue Dawn sometimes to keep my sanity, well; I’m gonna do it. This was one of those sweet grease stains that wasn’t there before you washed your clothes, and them “amazingly” appeared once out of the dryer. Sheesh. Just like my carpet, I spot tested for colorfastness before use. I sprayed on the stain spray and let it sit for a few hours before laundering. The results were magnificent. 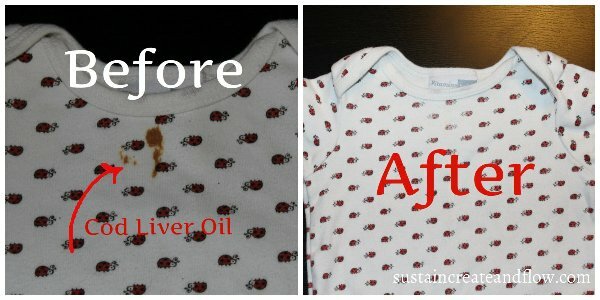 This third one was cod liver oil on Sweet baby’s onesie. One of my favorite onesies infact. This darn thing sat atop her dresser for the past 6 months; due to my reluctance in trying to battle it clean. As you can see from the photo, I may have agitated the stained area a bit too much, but this was a tough, old, set in stain that needed to be put through it’s paces. I sprayed and did some quick scrubbing, and then rinsed in cold water. Then I sprayed again and l left it to soak for a few hours before laundering. The results were brilliant. I waited so long that this onesie doesn’t fit now– unless I have one of these ! (In my opinion, bodysuit extenders are a must-have for every frugal baby). Have you made a DIY stain-remover? Do share your recipe and results with us! I’m going to try this as soon as possible! One of my regrets with continuing to wear my pre-pregancy tops during pregnancy with a bella band to save money on maternity clothes has been that I’ve stained every single one as I am constantly re-navigating where my body ends. Looking forward to reviving them! This looks great! Gonna try it soon! I wash my massage sheets with Dawn because it’s so awesome at getting out oil! I have been making this recipe for a year now. Love it! Works great. Hi! Thanks for sharing! I have the perfect stain to try this out on. I can’t wait! I love adding to my natural cleaners and this one sounds so easy! Moving to a new home. 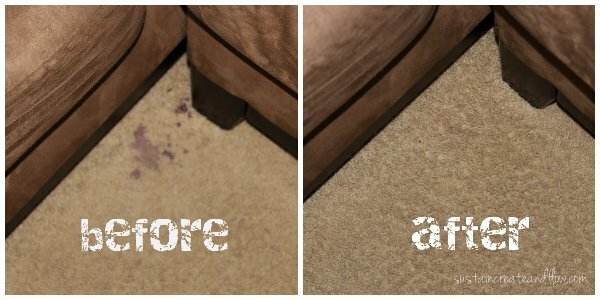 Got a few stains on carpet in old house. I will try this. Thanks! Thank you for the post. I’ve been trying to improve as a frugal mum recently – I’m not entirely sure how good I’ll be but every little helps! The last few weeks I’ve been trying to improve on the upkeep of our carpets and rugs. In the past I’ve used a company to come in and clean them – I haven’t ever had any complaints, I used carpet cleaning birmingham and anyone not wanting to do it for themselves I’ve no problem recommending them. But I’ve been reading lots of blogs like this recently and I think I can have a good bash at it now the kids are all at school through the day! Thanks again, wish me luck! This works with Palmolive dish soap, too. I don’t use Dawn because it’s made by Procter and Gamble. They needlessly torture animals in their labs. Thank you so much for providing this info! As soon as I’m ready to get new dish soap, (which will be a long time because I don’t use it on my dishes), I’m going to give Palmolive a try. If it works well, iId be willing to edit the recipe. Are you certain that Palmolive doesn’t do the uneccessary torturing? Where are you geting your info? do you blot it after or what let it dry ? 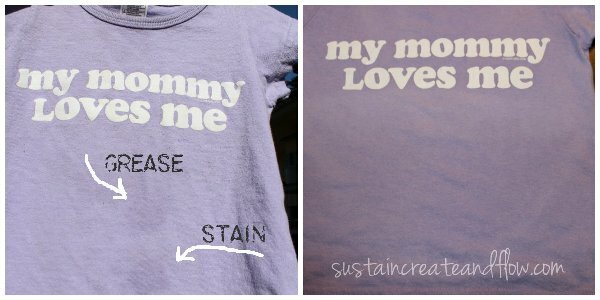 I just tried a similar solution on old, stained baby clothes and they all came out spot-free! It was 1 part hydrogen peroxide, 1 part blue Dawn, and 2 parts baking soda. I mixed it up in a bowl and scrubbed it on the stains, let sit awhile, then washed. So I started using it on all out stained clothes, even ring-around-the-collar. Everything came out clean. We live in the UK and cannot purchase Dawn. Will any washing up liquid do the same thing? I’m not sure, Angie. I think Dawn is sort of magical in this. Since it’s not too spendy of ingredients, let us know if you tried an alternative and how it works! Perhaps you can order Dawn on Amazon?